The United States Naval Academy (USNA) was established in 1845, and is the second oldest of the United States’ five service academies. Candidates for admission must apply to the academy and receive a nomination, usually from a Member of Congress. 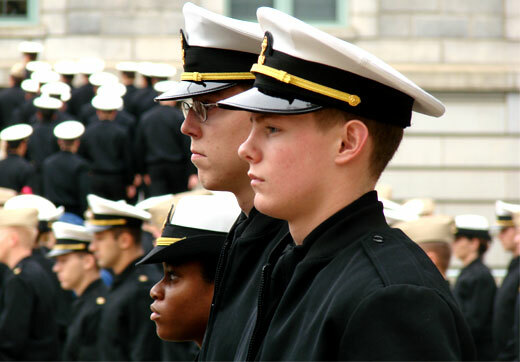 Once they are accepted, the students become officers-in-training and are referred as midshipmen. Upon graduation, they are expected to serve for either the United States Navy or United States Marine Corps. The campus is located on the former grounds of Fort Severn and is home to many historic buildings and monuments. Visitors are welcome to tour the campus and explore notable artifacts including a copy of the original bell which was brought back by U.S. Commodore Matthew Perry from his mission in Japan in 1855, famous flags of the U.S. Navy and captured flags from enemy ships, and the Pearl Harbor Memorial.